Yoga at The Women’s Initiative helps women restore a feeling of safety in their bodies. Increasing research testifies to the healing power of yoga and other mindfulness practices. Bessel Van Der Kolk, a professor of psychiatry at Boston University Medical School and a leading researcher in traumatic stress, has found that frequent yoga practice over extended periods of time helps decrease symptoms of PTSD and depression in women. The Women’s Initiative offers new yoga classes each season. Examples include Chair Yoga; Gentle Yoga for Mindfulness; and Yoga for Women of Color in partnership with Common Ground Healing Arts. Click here to see our current yoga and other mind-body offerings. Yoga and mindfulness practices can help us befriend our bodies and their sensations, release muscular tension instilled not just by everyday stress but by traumatic histories, and use our breath to regulate our nervous systems—all processes that trauma is apt to disrupt. Mind-body programming at TWI is free and open to all women and all bodies.Though any community yoga or mindfulness class can help one to heal, our trauma-sensitive program is unique in that it puts particular emphasis on cultivating physical and emotional safety. In TWI mind-body classes, all "instructions" are really invitations: a participant is as free to exit a pose or a movement or the room as she is to enter it. And this invitation is itself part of the healing, enabling a sense of physical and emotional agency that the traumatized body may have forgotten. This article is adapted from our Winter 2018 Newsletter. A recent cohort of immigrants and refugees celebrates the completion of their mental health leadership training with a potluck at The Women’s Initiative. Photo by Viridiana Reyes. A collaboration between The Women’s Initiative and the International Rescue Committee (IRC) is promoting resilience in immigrant and refugee communities in Charlottesville. Trauma-Informed Cross-Cultural Psychoeducation (TICCP) Leadership Training begins its fourth cohort this June with a series of workshops that help immigrants and refugees develop their leadership skills around well-being and mental health. TICCP is a “train the trainer” curriculum created by Dr. Hyojin Im, Assistant Professor of Social Work at VCU. Participants learn how to raise awareness around the mental health impact of refugee and immigrant trauma as well as cultural adjustment to a new country. They also enhance their competency for mental health and support within their community. Additionally, they form a healing partnership with mental health professionals that will improve health care access for their community. Participants trained in this model will be able to teach community wellness workshops in their native language. Previous cohorts of this program have included immigrants and refugees from nine countries. The training is free and comprises eighteen hours over six workshops. Participants must be proficient in reading and speaking English. If you or someone you know would like to be a part of the next cohort, contact Ulises Martinez: umartinez@thewomensinitiative.org or (915) 274-8512; or Megan Young: megan.young@rescue.org or (434) 979-7772 x119. We're thrilled that Oprah Winfrey is spreading the word about trauma-informed care. In an interview with CBS This Morning she discussed her enthusiasm for the model of care that replaces the question "What's wrong with you?" with "What happened to you?" Oprah called the conversation around trauma-informed care a "game changer." The Women's Initiative provides trauma-informed mental health care to women who otherwise would not be able to access it. The majority of our clients have been impacted by traumatic events and we are committed to helping them heal through therapy, movement, groups, and education. We also work collaboratively with the Greater Charlottesville Trauma-Informed Community Network. Oprah's full report on childhood trauma will air on CBS's "60 Minutes," this Sunday, March 11, at 7 p.m. Recommended reading: "What Do Asthma, Heart Disease and Cancer Have in Common? 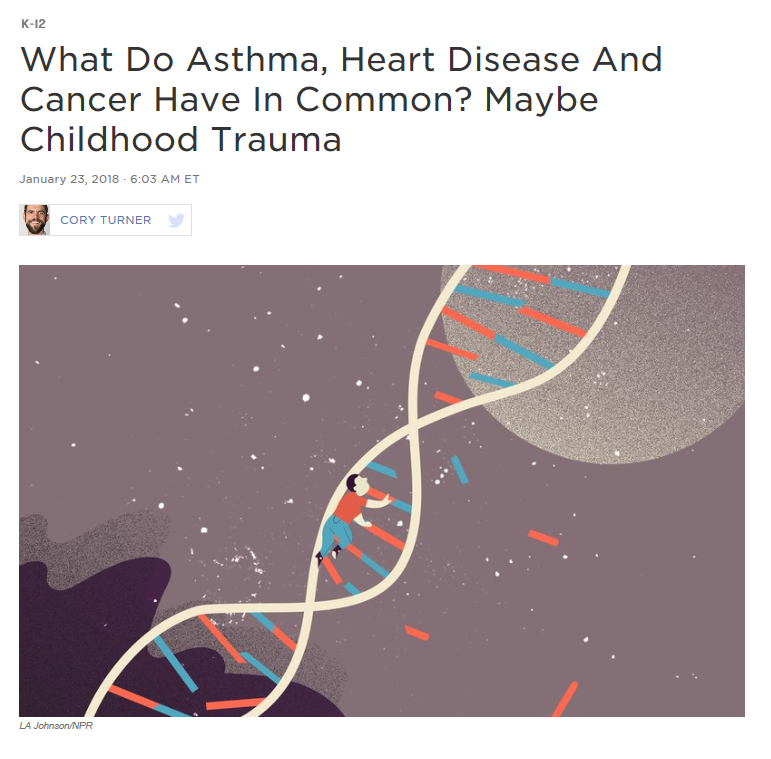 Maybe Childhood Trauma," from NPR. Read this report and learn about the severity and prevalence of childhood trauma, also known as toxic stress. This public health issue affects so many in our community, including many of our clients. That's why we are bringing greater awareness of all the ways to heal trauma—including therapy, movement, groups and education. Join us on Wednesday mornings for Chair Yoga, a gentle and therapeutic offering that promotes strength, flexibility, healing and mindful attention. Chair Yoga is a part of our expanded Mind-Body Program to meet the holistic needs of women who have experienced trauma. 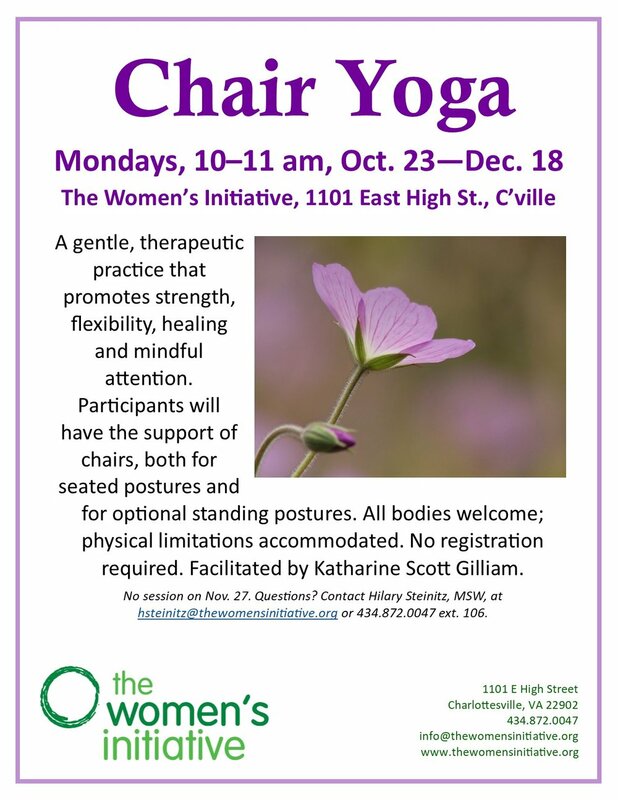 Katharine Scott Gilliam teaches Chair Yoga at The Women's Initiative, which is free and open to all women and all bodies. The class meets every Wednesday at our main office, 1101 East High Street, from 11:15 am-12:15 pm. Katharine Scott Gilliam teaches Chair Yoga at The Women's Initiative. The Greater Charlottesville community came together Tuesday morning to commit to addressing trauma as a major public-health issue. Theresa Caldwell, left, and Dr. Allison Sampson-Jackson. Dr. Allison Sampson-Jackson and Theresa Caldwell lead a conversation entitled “Trauma: How it affects you and every member of our community” at the Paramount. More than 700 people were in attendance. The Women’s Initiative was a co-host of the event in partnership with Adiuvans, the Greater Charlottesville Trauma-Informed Community Network, ReadyKids, Piedmont CASA, the Community Mental Health and Wellness Coalition and the Early Education Task Force. Toxic trauma is the result of prolonged or multiple exposures to adverse childhood experiences, abbreviated ACEs, such as physical, sexual and emotional abuse. A landmark study in the 1990s established that these experiences are common and can impact many aspects of physical and mental health, even leading to early death. Additional research is also connecting multigenerational trauma and historical oppression of minority communities to negative health outcomes. Theresa Caldwell, left, and TWI Board Member Beverly Adams, PhD. A recent study, for example, found that 61% of mental health conditions that caused a disruption in work or other activities for 14 days or more were related to ACES. “People are dying, going to jail, suffering...we have to be able to talk about it,” Sampson-Jackson said. Sampson-Jackson and Caldwell also stressed that resilience—the ability to bounce back from difficult experiences—can be built and nurtured in individuals, families and communities. The Women’s Initiative is committed to being a leader in trauma-informed care in Central Virginia. TWI Executive Director Elizabeth Irvin, LCSW, is on the steering committee of the Greater Charlottesville Trauma-Informed Community Network and is co-chair of the Community Mental Health and Wellness Coalition. And, as a part of our 2016-2020 Strategic Plan, The Women’s Initiative is creating a comprehensive trauma program to bring greater awareness of all the ways to heal trauma—including therapy, movement, groups and education. To learn more or become involved in the Greater Charlottesville Trauma-Informed Community Network, email Trauma@PCASA.org and include your name in the body of the email. We're growing our Mind-Body Program to help heal trauma through movement. Trauma-informed yoga, dance and other movement styles help release muscular tension stored in our bodies because of both everyday stress and histories of trauma. These practices also enable us to use breath to regulate our nervous system, a process which trauma often disrupts. All of these offerings are free and open to all women and all bodies, and no experience is required. 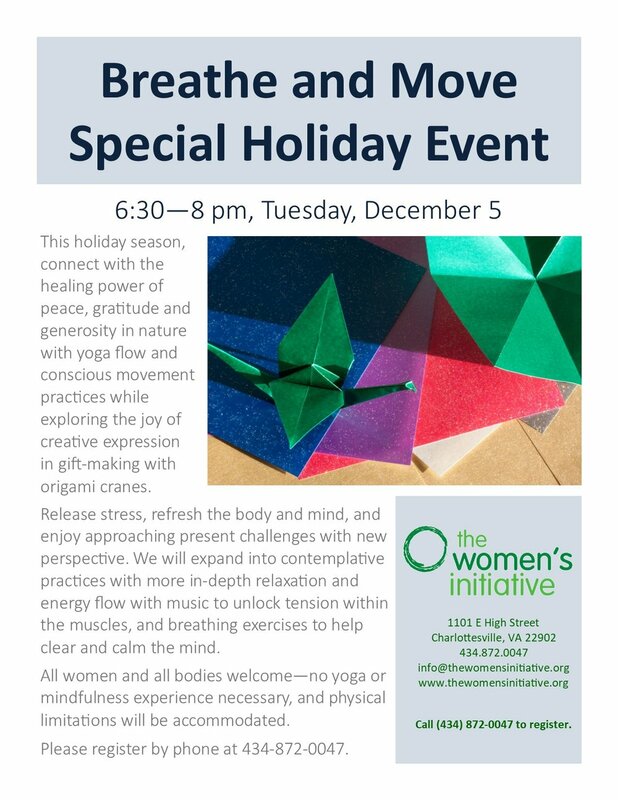 Additionally, The Women's Initiative will be hosting a special Holiday Breathe & Move event, with yoga as well as origami paper-crane-making. Call (434) 872-0047 to reserve your spot, and check out the Facebook event!